How often do we find ourselves sinking when the circumstances of our lives rage? How many times do we find ourselves buckling under the pressure of the storm? This reminds me of a time in Matthew when the storm was raging and the disciples feared for their very lives. The moment when all hope seemed to be gone, when it seemed the storm would consume them, when it seemed no one could save them … it was at this very moment hope appeared. They looked out across the storm, across the crashing waves, through the wind and rain and saw Jesus! In the midst of the storm He revealed Himself. It makes me wonder how long He stood there, on the water, waiting for them to see Him. Had he been there the whole time, yet the disciples could not see Him because they took their eyes off Him and they focused more on the wind, the waves and the sheer force of the storm? The disciples were terrified of everything they were facing – the terrible winds, the huge crashing waves, the pounding of the rains, the size of their small, frail boat compared to the massive size and strength of the storm that surrounded them. Even through all that it wasn’t until they saw the “ghost” – the last straw so to speak – that they cried out. What did they said? What cries came out from what they were feeling within? What about you? What would you say? I think there are more times than not when fear tends to consume us. All we need to do is to cry out to the master. He’s already there in the midst of our storms, willing and ready to calm the seas. With our eyes focused on Him we have no reason to fear the rains, the floods, or the winds because our house – His temple – WILL NOT FALL “for it has been founded on the rock”. Today let us be reminded of not only Jesus’ response to His beloved’s cries, but may we also be reminded of the events that took place after He revealed Himself. Peter, oh precious Peter, asked Jesus to let him come out to where He was, and we all know what happened next. Peter takes his eyes off the face of Jesus, he, Peter, begins to sink. Jesus later calls Peter, “You of little faith”. He calls him, the one who actually stepped out of the boat, onto water, onto the rough seas, out of the security of the boat, out into the very elements of the storm. He is the one Jesus refers to as “You of little faith”. 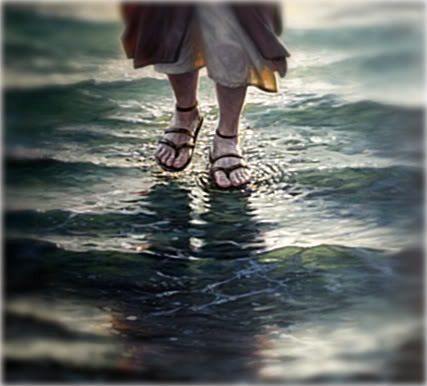 Is your faith in Jesus, and who He is and what He is capable of, strong enough to allow you to step out of the boat? To voluntarily leave the security of whatever protection you have from the elements of the storm? To step out into the crashing waves, the gusting winds, and the unstable waters? To face whatever you may in order to stand and see Jesus face to face wherever He is? Oh Precious Heavenly Father, You who are of infinite wisdom, and total sovereignty. Thank you for mentioning this account. Thank you for telling of such a faithful follower of Christ. So many people give Peter a bad rap for this, but Lord, out of all the others, he was the only one who asked to go where Jesus was. He moved out of his comfort zone, into the middle of the storm and began his journey to the Lord. Peter was willing to risk it all in order to be with Jesus! Lord may we be as courageous as Peter, and may our cries always be directed to You – the only one capable of calming the storm. For it’s in Jesus name we pray … AMEN! Amen. Stepping out of that boat sure isn’t easy but if we keep our eyes focused on Christ instead of the storm raging around us we will be able to walk through the roughest of seas. Amen! Thank you for taking the time to share a piece of your heart! Praying God’s blessings for you! Thank you! Prayers are always appreciated. 🙂 Be blessed!